Fiat is showing off its new 2014 model lineup at the Geneva Motor Show running the 6th to 16th of this month. 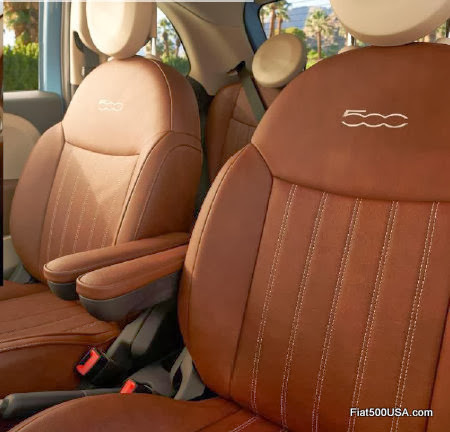 The 2014 Fiat 500 brings a host of trim and paint changes, plus the introduction of the new top of the line version called the Fiat 500 Cult, and the European debut of the Fiat 500 "vintage 1957" show car. 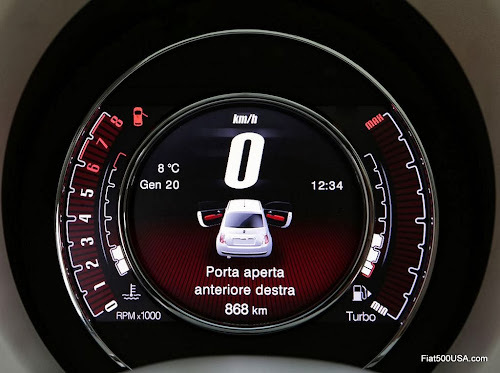 The most significant change is the availability of a new digital instrument panel that may give a clue to what we will see in future Fiat 500s. 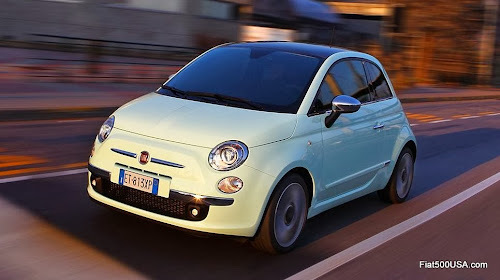 Three new body colors will be available on the 2014 Fiat 500 - Lattementa Green, Three-layer White and, exclusive only to the S trim package, Italia Blue. Along with the paint, three new alloy wheels in 15" or 16" are available as standard depending on the trim level. 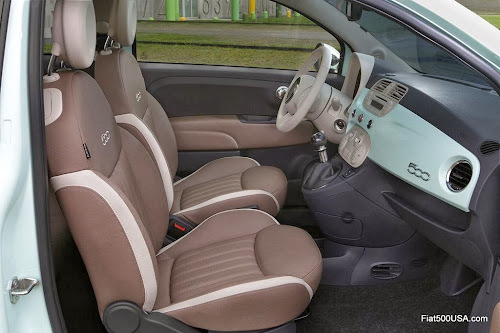 There are also new interiors available in fabric or leather with specific combinations for each trim level. The new digital instrument panel is standard on S and Cult trim levels and optional on Lounge models. Developed in partnership with Magneti Marelli, the panel features a 7" TFT digital display with speedometer, rev counter, fuel and engine temperature gauges and trip computer. 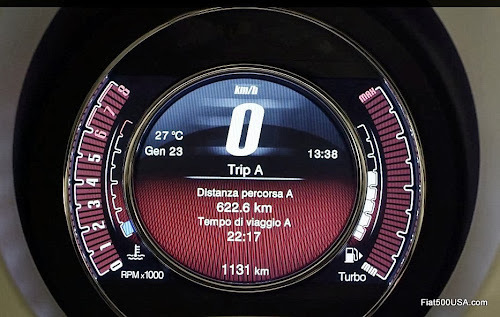 The central section of the display shows an image of the car and reports back information provided by the trip computer, such as distance travelled, instant and average fuel consumption, range, etc. Blue tooth operation and media information along with various warning lights are additionally provided for. 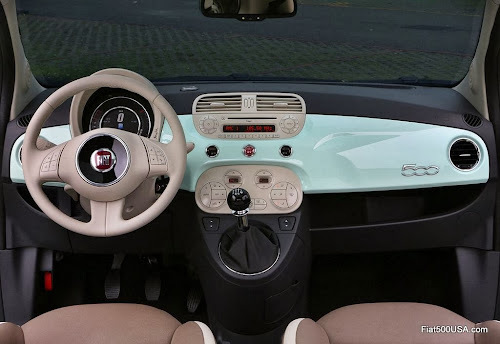 Fiat 500s equipped with the dash mounted TomTom satellite device will also display additional navigation information in the digital panel. There are five engines available for the European Fiat 500 - the 0.9L TwinaAir in 85 and 105 HP form, the 95 HP 1.3L MutiJet II diesel engine and two 69 HP 1.2L FIRE engines in gas or natural gas. The newest engine is the two cylinder 105 HP TwinAir Turbo now with MultiAir 2. 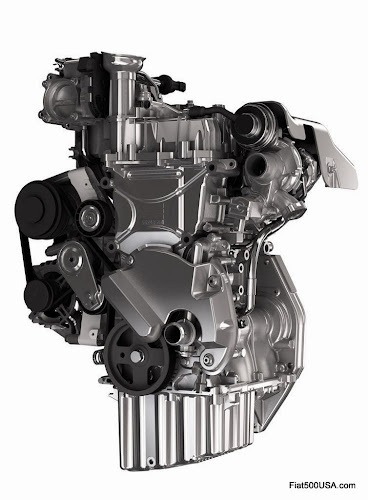 This 0.9L engine is rated at 105 HP at 5,500 rpm and a maximum torque of 107 lbs-ft (145 Nm) at just 2,000 rpm. The TwinAir outperforms the four cylinder 1.4L 16V FIRE engine (100 HP at 6,000 rpm and 97 lbs-ft at 4,250) that was discontinued last year. The concept of the TwinAir is to offer a small displacement, high torque engine that is fun to drive. Other car makers have tried this, but the difference is that Fiat has MultiAir infinitely variable valve timing. This allows a small engine to develop high torque at a low rpm and to maintain that torque throughout the rev range. What is more, MultiAir is tuned to boost torque at part throttle conditions making the car feel lively and stops the need to constantly wind each gear out to achieve acceptable performance. The updated MultiAir 2 system is an enhanced version of the original that brings about further improvements in terms of efficiency and driving pleasure. Specifically, because MultiAir 2 can decouple and open the intake valves independently from the intake cam lobe, the intake valve opening has been optimized to precisely modulate the amount of exhaust gas recirculated in the combustion chamber via valve overlap, giving the engine internal EGR. Exhaust gas recirculation is important to lower emissions, however; it can have a negative effect on driveability, so the ability of MultiAir 2 to precisely regulate the amount of EGR in the cylinder has a large impact on making a TwinAir equipped car a lively, fun to drive experience. A new low inertia turbocharger also plays a role in this. The proof is in the performance: 0 to 62 mph (100 km/h) in 10 seconds and a 117 mph (188 km/h) top speed. This is half a second quicker and 4 mph faster than the previous 1.4L four cylinder. All achieved while having among the lowest consumption and emissions in the segment: in the combined type-approval cycle, 4.2 liters of petrol every 100 km (approximately 55 mpg) and 99 g/km of CO respectively. For maximum efficiency and minimum emissions, the car starts off in ECO mode that limits engine torque to 89 lbs-ft (120 Nm) and power to 98 HP. 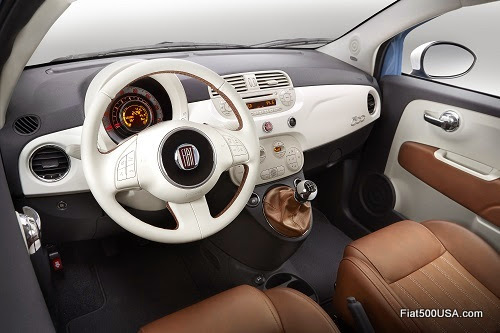 ECO mode can be turned off via a button on the dashboard, similar to the US Fiat 500's Sport button. The Fiat 500 Cult is the new top-of-the-range model available hardtop or cabrio configurations. The hardtop roof is one part fixed glass and the other part gloss black paint for a sleek, one-piece look. A new Three-layer White will be available on the cabrio version. Door mirror covers can be had in either chrome or glossy black. There are also glossy black surrounds for the rear light clusters and a new 16" alloy wheel design. 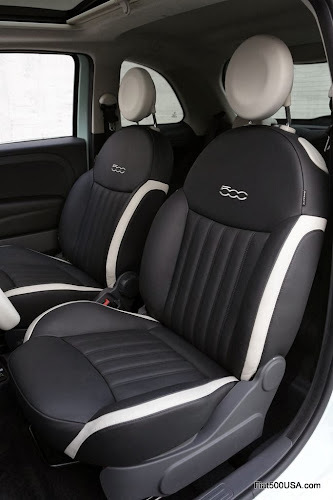 Inside, new leather seats are featured in a choice of black leather (ivory or red inserts), tobacco leather or red leather (both with ivory inserts). In addition to being attractive, the new upholstery design offers improved ergonomics and comfort. The new 500 Cult is available with the 95 HP 1.3 MultiJet II turbodiesel, the 69 HP 1.2 and 85 HP 0.9 TwinAir Turbo petrol engines (both also available with Dualogic robotized gearbox) and the new 105 HP 0.9 TwinAir Turbo. The new model is very well equipped. The 500 Cult gets the new 7" TFT instrument panel display, automatic climate control, rear parking sensors, fixed glass roof with sun blind, leather seats, leather steering wheel with Blue&Me controls and Dualdrive electric power steering. A CD/MP3 radio and Blue&Me features a hands-free system with Bluetooth technology (voice recognition, steering wheel controls, digital audio file player with USB port). The Geneva Motor Show will mark the European unveiling of the Fiat 500 Vintage 1957 show car. 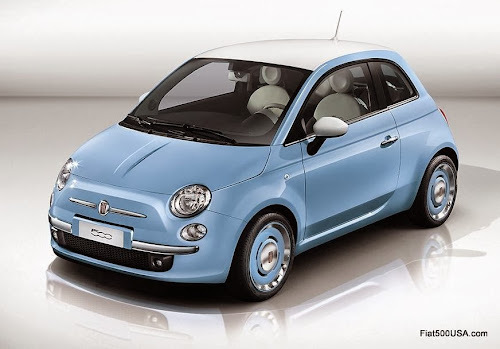 This Fiat 500 pays homage to the original Nuova Fiat 500 that debuted on July 4, 1957. Compare the European Vintage 1957 Show Car to the North American production version below. Note the production car, known as the Fiat 500 1957 Edition, looks similar to the European show car, but has a body side molding and a black antenna. The show car is missing the molding and has a white aerial. This 500 show car is very similar to the Fiat 500 1957 Edition that is about to go into production in North America. On the outside, the two cars appear nearly identical with two-tone paint (Volare Blue and white roof/spoiler) with white door mirror covers, and 16" vintage style alloy wheels with light blue chrome Retro-style hub caps. Outside differences are the North American production car has a black aerial in place of the all white one used on the Euro show car and a body side molding. 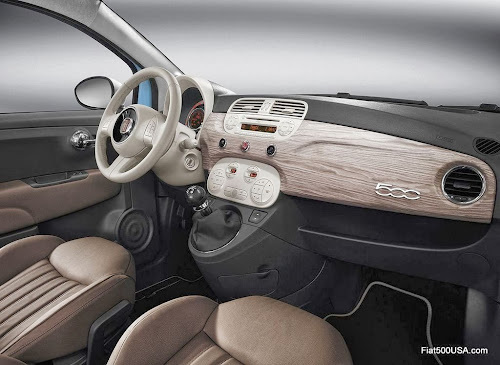 The show car features a unique "open-pore wood" style dashboard. The production car sports two-tone door panels and leather steering wheel. A color coordinated leather shift boot and chrome shift knob. Both cars feature vintage looking Fiat badging. Inside is another matter as the production car has a quite a few changes over the show car, with custom two tone door panels and steering wheel, different shift boot and an upholstery change. The most striking difference inside is that the show car has a curious dashboard that resembles "open-pore wood" while the North American 500 1957 Edition uses a conventional white painted one. Another look at the interior of the European show car. 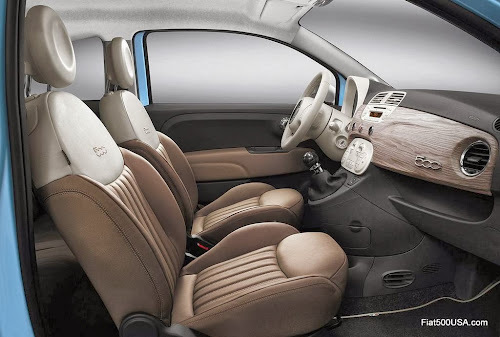 Two-tone Tobacco and Avorio (ivory) leather seats and wood style dashboard stand out. The North American production car has Marrone (brown) seats with Avorio (ivory) head rests. The brown seats were a common color theme used in vintage Fiats.